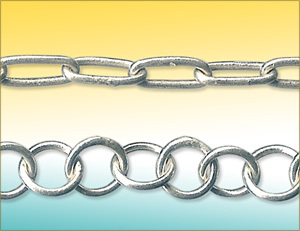 "Wow, I can't believe that I successfully made my first fused chain bracelet after going over your instructions for the very first time! The instructions were very clear and the pictures were extremely helpful! I can't wait to experiment more! 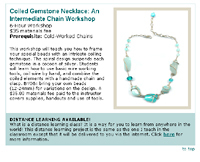 Your distance learning class was worth every penny and I highly recommend your class to anyone who wants to expand their jewelry-making knowledge and technique!" 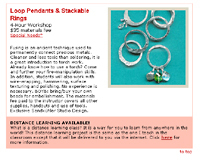 Which workshops are currently available? There are two ways to find out! First go to the workshop description pages and scroll down to find a blue (for cold jewelry) highlighted box or pink (for hot jewelry) after a workshop description. Details regarding what workshops are currently available and how much they cost are in a PDF document called, "What's Available and How Much?" Read on to learn how to get a PDF reader. Once you have the PDF reader, request this file and I'll send it! This type of learning is a lot like an independent study. When I was a professor at Georgia Southern University, my graduate students and I would negotiate a project and schedule. Then I would give them instructions which they carried out on their own. If they got stuck, I'd be available to help them. Unlike Graduate School, there aren't any deadlines. You can speed right through the instruction or stretch it out over time to accommodate your life. Distance Workshop via the Internet... how does it work? This is a private lesson. You won't be in a "virtual classroom" with dozens of other people. It's just you and I. The majority of my lessons are in step-by-step instructions. Lots of photographs (for the visual learners) and simple text. If you get stuck, I welcome the opportunity to take more photos and/or describe a step in more detail. The Microsoft Word files have been converted and compressed into a PDF files. Otherwise, the Word file would be too huge (because of all the photos) to send across the internet. You will need the application, Adobe Acrobat Reader to open the compressed file. This is a free, downloadable application. For both domestic and international payment, I accept PayPal. If you are in the United States, I can take a personal check. Make it out to Iris Sandk�hler. If you are outside of the USA I can also take an international bank check (additional fees may apply), or an American Express Travelers Check made out to Iris Sandkühler. My needs as a teacher...yes, I have needs too! I am looking for testimonials for the website. Feedback, suggestions etc. are encouraged. If it's possible for you to send me images of your work, that would be great! What you will be buying is the right to use the virtual workbook to learn from and to have access to me, the instructor. What it does not give you is the right to do is copy the document and share it in any way by any means. These documents are protected under international copyright and intellectual property laws. So.... what do you do next? Let me know when that's done and I'll send details and photos of "What's Available and How Much?"